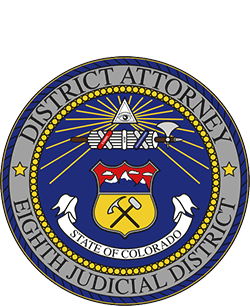 Clifford E. Riedel is the District Attorney for the Eighth Judicial District of Colorado. Cliff attended CSU and obtained a BA in speech. He attended Law School at CU-Boulder and graduated in 1979 with a Juris Doctorate Degree. Cliff served as a municipal prosecutor in the City of Arvada from October of 1979 until March 31, 1980. On April 1, 1980, he started as a Deputy District Attorney for the Eighth Judicial District in Fort Collins. Cliff worked his way up through the ranks. Cliff has handled all manner of cases: from the most serious and sensitive cases to the most routine. Cliff has been the recipient of the Larimer County Bar Association's Professionalism Award as well as the Conrad Ball Award for making significant contributions to the quality of justice in Larimer County. Cliff sincerely believes that the role of the prosecutor is to "seek justice and follow the truth" and that will continue to be the goal of this office. The District Attorney is an elected official and serves a four year term. Under state law, the District Attorney is limited to (2) four year terms. Can the District Attorney tell the police and/or sheriff what to do?